SE-L Nav models as standard will feature 17-inch alloy wheels, LED headlights with cornering function, LED front fog-lights, front and rear parking sensors, automatic headlights and wipers, auto-dimming rear-view mirror, dual-zone climate control, cruise control with speed limiter, satellite navigation, and DAB digital radio. Moving up to the Sport Nav grade adds 19-inch gunmetal alloy wheels, reversing camera, power tailgate, heated power-adjustable leather seats, heated steering wheel, active driving display, keyless entry, Bose 10-speaker sound system, traffic sign recognition, and a power sunroof on 175PS diesel models. An optional £800 Safety Pack for Sport Nav diesel models adds blind spot monitoring, rear cross traffic alert, lane-keep assist, rear smart city brake support, and adaptive headlights that use a forward-looking camera to alter the beam pattern to allow permanent use of high beam without dazzling other drivers. 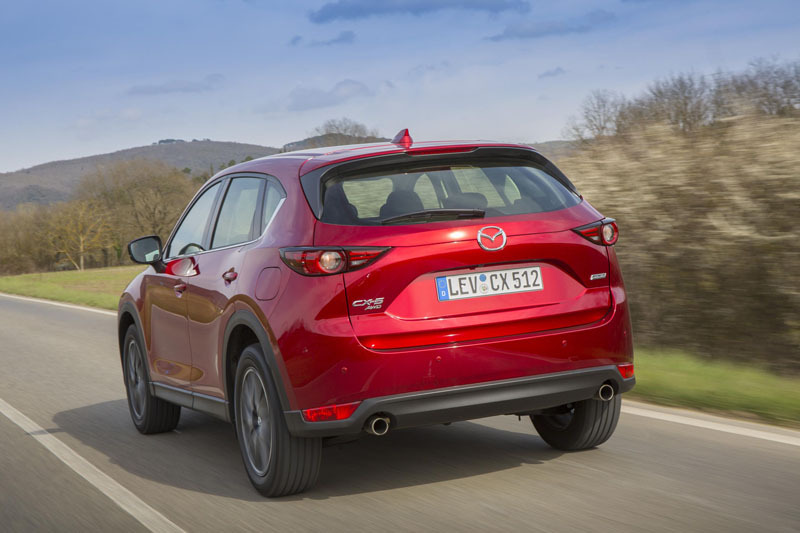 In addition, Mazda’s radar cruise control can be added to 175PS Sport Nav Diesel Auto models for another £800. 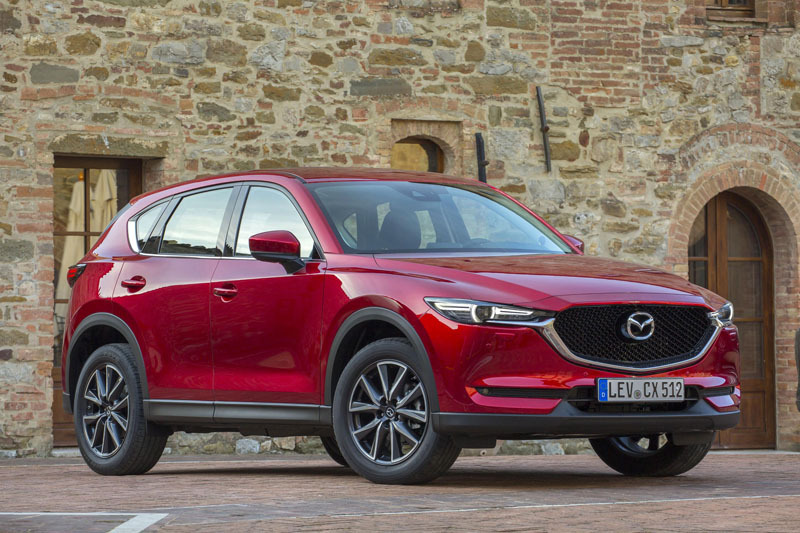 Three engines are available, starting with a 165PS 2.0-litre petrol unit that’s offered in two-wheel-drive manual form only. 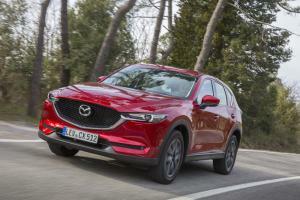 This is followed by the familiar 2.2-litre diesel with 150PS, and is available in either manual or auto, 2WD or AWD guises – although confusingly you can’t have both AWD and Sport Nav trim. For that, you’ll need to jump up to the 175PS version, which is available exclusively in AWD Sport Nav form with either six-speed manual or automatic transmissions. Given the growing move away from diesel by the buying public, the lack of choice with regard to petrol models may count against it. 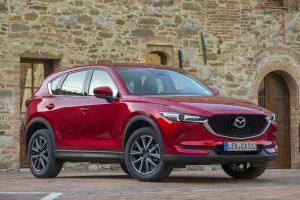 The new Mazda CX-5 arrives in UK showrooms in June. 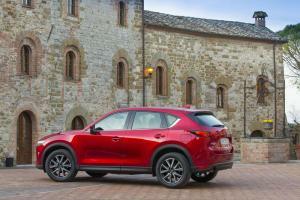 **** Optional on 175ps Sport Nav Auto Diesel models in combination with Safety Pack. Not available with Stone Leather.